Saturday March 2nd, as part of the Treefort Music Fest showcase after-party catch The Dirty Moogs with fellow Boise group Lionsweb and Portland’s And And And for a great finale event at The Art Center at The Old Library. 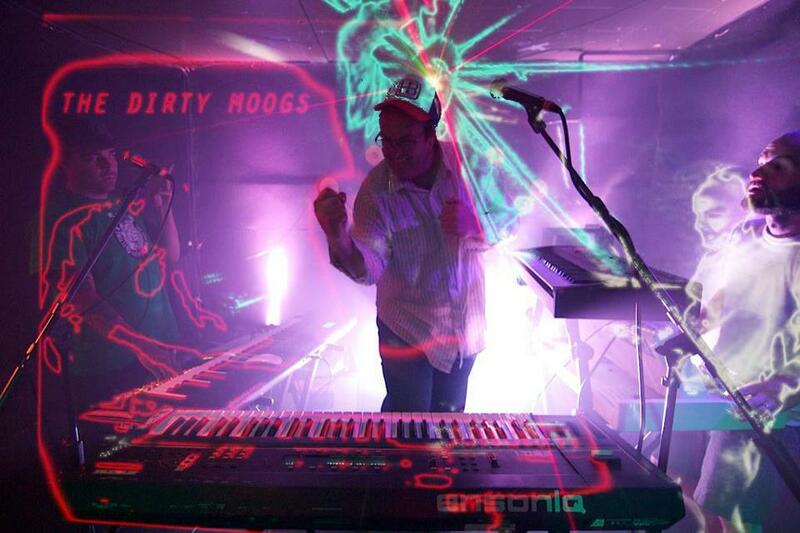 While Boise, Idaho based trio The Dirty Moogs twiddle their knobs in homage to their synthesized heroes (Kraftwerk, Sparks, et. al) they add the element long forgotten by synthesizer music; fun. Dream the dream that was electronic music in 1977, a simpler time when robots were still cool, nobody except nerds cared about synthesizers, and analog synths were a dirty affair. Or, at least as dirty as methodical, machinist German electronic specialists would allow. Certainly, analog synth dance bands are not necessarily a groundbreaking phenomena in 2013, but what sets The Dirty Moogs apart from those who use the Moog as a gimmick, or even those who’ve managed to nail the Gary Numan/80’s soundtrack aesthetic, is the songwriting. While some of the tones are nostalgic, dancing is timeless, and the Moogs share the best of traits with their pioneering predecessors; memorable melodies and good songs.